On March 11, Missile Baits announced that they would be introducing to the angling world a soft-plastic Midwest finesse bait at the Bassmaster Classic Expo at Nashville, Tennessee, on March 15, 16, and 17. It is called the Ned Bomb. 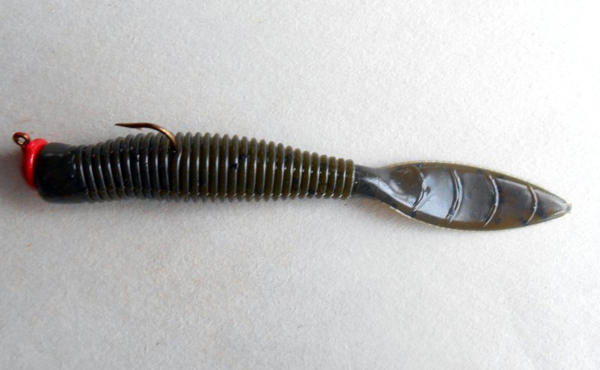 It is said to be an adaption and miniaturization of Missile Baits’ D Bomb, which is a four-inch creature bait that is graced with a ribbed torso and adorned with a flat and thin beaver-style tail. The D Bomb is a tool that scores and scores of power anglers employ to flip, pitch, and punch. It also incorporates the features of Missile Baits’ Bomb Shot, which is a soft-plastic finesse worm. In October of 2018, John Crews and Byron Childers of Salem, Virginia, sent us three prototypes of the Ned Bomb to field test. Crews, who competes on the Bassmaster’s Elite circuit and other tournament venues, is the proprietor of Missile Baits. Childers is the director of sales. During our field-testing endeavors, we affixed the green-pumpkin prototype to either a chartreuse 1/16-ounce mushroom-style jig or a chartreuse 1/20-ounce mushroom-style jig. On Oct. 5, the prototype caught 32 largemouth bass, five green sunfish, and one crappie in three hours. Then on Oct. 19, the prototype caught 33 largemouth bass and one smallmouth bass in four hours. It is critical to note that the black bass fishing in October of 2018 was very difficult in the flatland reservoirs of northeastern Kansas, which is where we tested the prototype. During the Bassmaster Classic, Childers sent us several of the final renditions of the Ned Bomb to work with and examine. It is a multifaceted stick-style bait that is 3 1/4 inches long. The tip of its head is flat and circular shaped. At the center of this tip, there is a minor indentation, which is where the hook and collar of a mushroom-style jig are inserted. The diameter of the tip is five-sixteenths of an inch with a circumference of about 1 1/16 inches. The head is cylinder shaped. It is five-sixteenths of an inch long with a width of five-sixteenths of an inch and a circumference of about 1 1/16 inches. Its epidermis is smooth. The Ned Bomb’s cylinder-shape torso is 1 5/8 inches long. Except for the last three-sixteenths of an inch of its torso, it is encircled with 31 ribs. Its dorsal area, ventral area, and sides are identical, and there is no demarcation that delineates the anterior section from its posterior section. But the width and circumference of the torso diminishes in size as it approaches its junction with its tail. The widest portion of the torso is situated seven-eighths of an inch from the tip of the head. At this locale, it has a width of thirteen-sixteenths of an inch with a circumference of about 1 5/16 inches. At its torso’s last three-sixteenths of an inch, the torso is three-sixteenths of an inch wide with a circumference of about nine-sixteenths of an inch. The epidermis of this short segment is smooth. Its flat and marquise-shaped tail is 1 5/16 inches long and three-eighths of an inch wide at its widest spot. The thickness of the tail is about one-sixteenth of an inch. The dorsal and ventral sides of the tail are embossed with four minor ridges that stretch from one edge to the other edge, and they are about a quarter of an inch apart. Between three of the ribs, the words Ned Bomb are imprinted on one side of the tail. Other than those two words and the eight ribs the epidermis of the tail is smooth. It is manufactured in the following hues: Barner Craw, Candy Bomb, Fisholicious, Goby Bite, Green Pumpkin, Green Pumpkin Flash, MM3 PB&J, Pinkalicious, and Sunfish IPA. It is not impregnated with salt, and they are buoyant. They are manufactured with anise oil, and a crayfish oil is added during the packing process. The prototypes were durable enough to withstand donnybrooks with 22 to 25 largemouth bass before they were too frayed to stay firmly affixed to a mushroom-style jig. When the head became tattered and torn, we shortened the Ned Bomb a tad by removing the head and a tiny segment of its torso, and this tactic extended its lifespan. And there were spells when the shortened Ned Bomb was more effective than the 3 1/4-inch one. A package of 10 costs $3.99. A green-pumpkin Ned Bomb affixed to a red 1/16-ounce mushroom-style jig with an exposed hook. When Midwest Finesse anglers affix the Ned Bomb to a mushroom-style jig with an exposed hook, they will be able to present it to their black bass quarries by employing all six of the standard Midwest finesse retrieves or slight variations of those retrieves. (1) Here is a link to Missile Baits’ website: https://missilebaits.com/product/ned-bomb/. (2) Here is a link to our Midwest Finesse gear guide about Missile Baits’ Bomb Shot: https://www.in-fisherman.com/editorial/missile-baits-bomb-shot/328774. 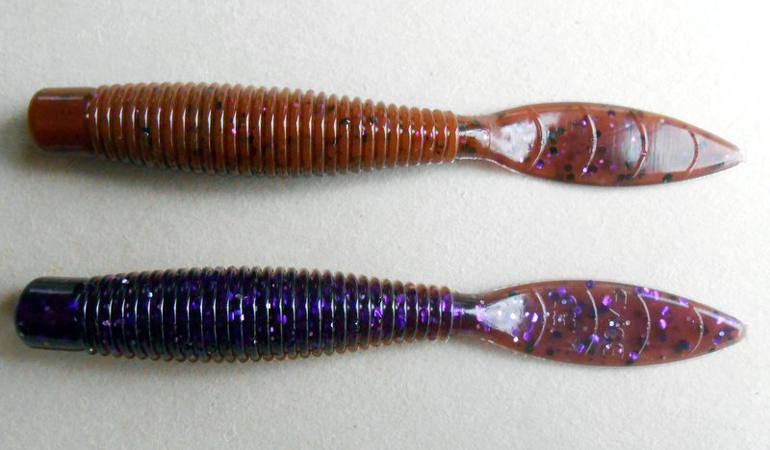 (3) Here is a link to our Midwest Finesse gear guide about Missile Baits' The 48 Worm: https://www.in-fisherman.com/editorial/missile-baits-the-48-worm/153430. (4) To read about our field tests with the Ned Bomb, please see the logs for Oct. 5 and 19, 2018, at this link: https://www.in-fisherman.com/editorial/midwest-finesse-fishing-october-2018/327987. (5) Here is the link to our Midwest Finesse column that explains how we execute our six standard retrieves: https://www.in-fisherman.com/editorial/six-midwest-finesse-retrieves/153946.